Want to get your kids in the Halloween mood? Or are you in need of a movie or TV show to entertain your littles for a while so you can get some work done? (yes, I said it. I don’t mean do this every day, but sometimes we all need a little distraction for our kids so we can be a little more productive). Check out this list of 40 not so scary and kinda scary Halloween movies and shows for kids. I bet you’ll even find some of your old childhood favorites. There are numerous movies for your youngest kids up to your preteens. 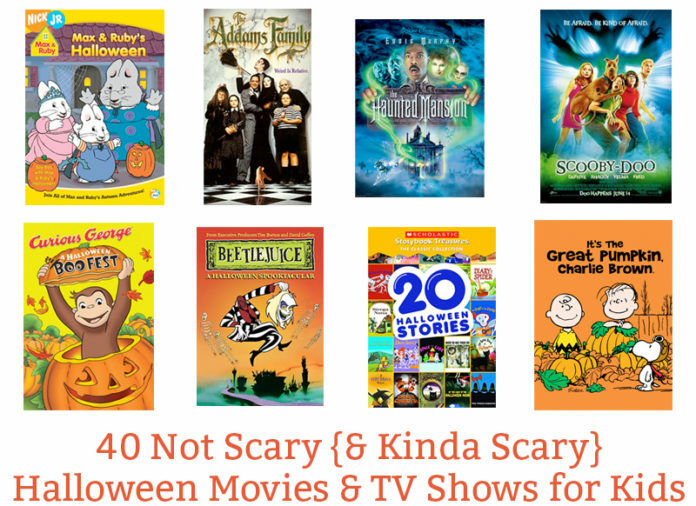 This list has a Halloween movie to fit any age. Did your favorite Halloween movie for kids make the list? If you have a great Halloween movie to add, send it over so I can add it to my list! Your favorite Winnie the Pooh characters come together for a Halloween movie. This is great for even your littlest ones. Who doesn’t love Halloween music? These not so scary songs are perfect to put on at a Halloween party or to just entertain your kids when you need to get a few things done. Hoops and YoYo are lovable characters that bring you this Halloween special. The characters are accidentally locked in a mall when looking for Halloween costumes. Your favorite Toy Story characters are here for a not-so-spooky Halloween special. This is one that even adults love (including my Mom). We are Cat in the Hat lovers in our house. My boys love the books and anything else by Dr. Seuss. The Cat in the Hat takes Nick and Sally on a wild, Halloween-filled ride. I had to include a Thomas on this list. My boys would watch anything if it had Thomas in it (and I mean anything). These short tales will bring a little bit of Halloween to your child’s favorite train-filled show. Even your youngest child will enjoy this Halloween themed special from Sesame Street. If you’ve never watched The Wiggles, be ready for a cheesy song-filled episode of Halloween goodness. A few Halloween-themed episodes from your child’s favorite characters. I love this DVD because the episodes aren’t long so you can play just one or the whole thing. I was surprised when my youngest saw an episode of Barney and was mesmerized. This giant purple dinosaur is still exciting little ones today thanks to streaming and DVDs. Check out Barney in this family-friendly Halloween spectacular. So this DVD is wonderful for any time of year. It contains of 20 classic children’s books that we absolutely love in our house. They are all Halloweenish in their themes. So I suggest leaving this one for Grandma or the Babysitter so that you don’t have to watch it. Caillou is still loved by many kids and if yours is one of them, you won’t want to miss this Halloween episode. We recently just caught some Dinosaur Train while on a mini vacation and my boys were enthralled. If your little ones are fans, this will help get them in the Halloween mood. Sid’s Spooky Halloween explains some of the science behind some Halloween themed topics such as how bats eat mosquito. This DVD set includes 5 spooky Madeline episodes to get your child into the Halloween mood. This episode of Max and Ruby focuses on costumes and trick or treating. It can be watched by even your youngest child. The Berenstain Bears’ books are one of my favorite childhood series. This special does a great job at explaining the truth behind scary objects which can help calm a child that’s a little leery at Halloween. Curious George stars in this adorable not-so-scary Halloween movie. It’s one of those that your kids may end up watching the rest of the year as well. How could I not include the best non-scary Halloween special, ever? This one’s like a right of passage for kids and Halloween. My oldest loves all of the Buddies movies but they took a little while to gain his interest. Spooky Buddies isn’t scary, it’s just a little too complicated for younger children. Eloise is geared towards children slightly older. This not to scary special takes place at none other than the plaza where Eloise is trying to convince others that something is spooky happening there. Don’t miss Sponge Bob and his friends down in Bikini Bottom in this Halloween special. If you loved old 90’s cartoons, bring some nostalgia to your kids this Halloween. This DVD is filled with Halloween specials from your favorite cartoons of the 90’s. Beetlejuice, the original movie, inspired these great cartoons from the late 80’s early 90’s. This DVD set includes the Halloween-themed episodes. Alivin and the Chipmunks have stood the test of time as a kid’s show. In the cartoon collection, Alvin, Simon and Theodore, will get you in the Halloween mood. This monster-filled movie will definitely get your kids in the spirit of Halloween. It’s full of humor and can be enjoyed by your slightly older children through your pre-teens. If you liked the first, you’ll want to check out the second as well. The live action Scooby Doo is just one of the many Scooby Doo options to get your kids excited about Halloween. Hocus Pocus is my second favorite “scary” movie as a child. It’s become a cult classic that is a must-watch for older children. Casper isn’t a “Halloween” movie per say but it’s about a friendly ghost which fits right in during the Halloween season. The Nightmare Before Christmas is the perfect movie for family Halloween movie night because it can be enjoyed by older children through adults. This stop-motion movie brought to you by the people that did The Nightmare Before Christmas, doesn’t disappoint. Again, it’s not technically a “Halloween” movie but it’s a great watch in October. The Addams Family (based on the original television show), is sure to interest your older children while taking you back to your childhood. Ghostbusters is on our list of movies our kids must watch. While you may want to rush to show this one to your little ones, wait just a bit because there are some slightly scarier parts that I think we often forget about. I’m going to be honest, I never watched The Witches until I was older (despite being a huge Roald Dahl fan). It would be great to read the book and then watch the movie (and begin teaching your child how movies, although good, are never as good as the book). Halloweentown was a Disney Channel film that has become a go-to Halloween movie for many families. If your kid’s have ever been on either of the Haunted Mansion rides, they’ll love this movie. This is one of the most controversial Disney movies out there due to it’s dark storyline. But, it’s a great movie perfect for Halloween. Now, believe it or not, this is my favorite scary childhood movie. My twin sister and I forced our friends to watch this over and over again (I am still sorry about that). But it’s awesome cheesiness is a great introduction to scary movies for kids. Did anyone else watch this one as a kid? Was just looking for a list of Halloween movies–yay! !